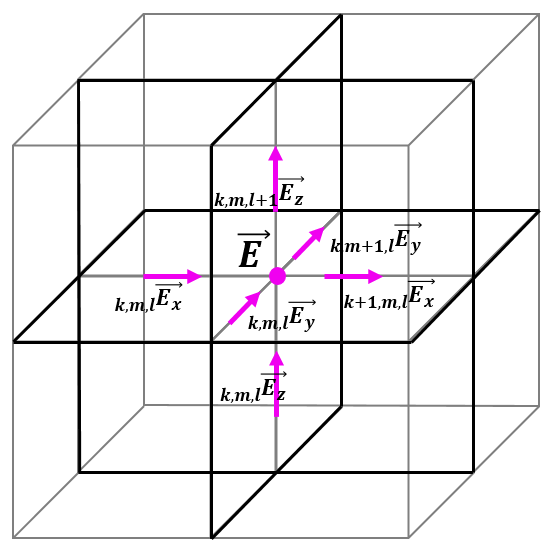 The FDTD method emulates the electromagnetic field as a function of discretised space and time, in response to the user-defined excitation. This facilitates direct monitoring of field values and evaluation of power and energy. Next to directional electric and magnetic field components, QuickWave delivers the total electric and total magnetic field in each FDTD cell. 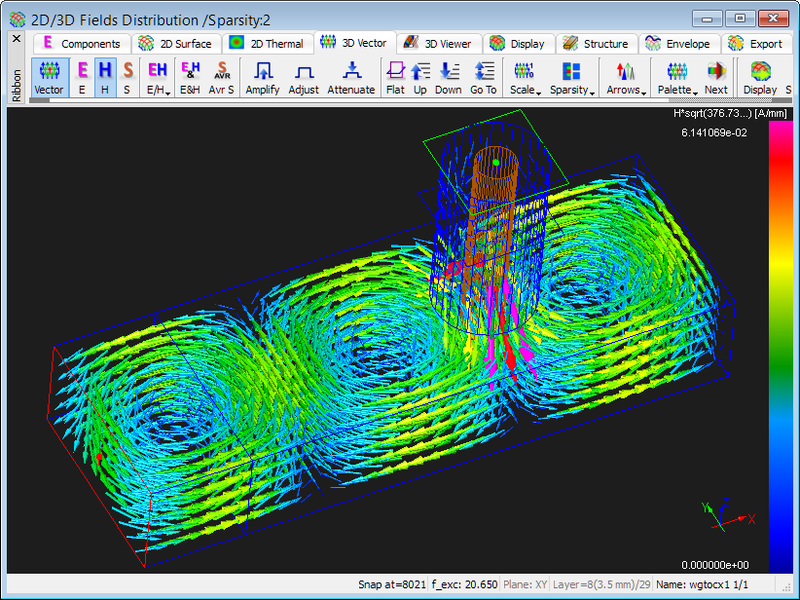 The total electric and total magnetic field in a single FDTD cell is calculated from several directional field components, as shown below. 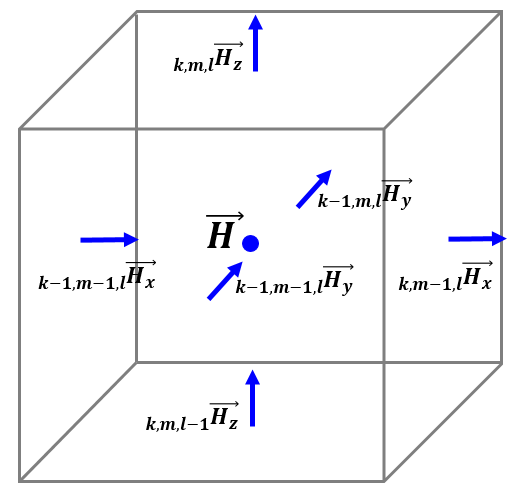 Figures show the field components for the total electric/magnetic field calculation in FDTD cell of k, m, l indexes and the position in space to which the total field value is assigned. QuickWave enables monitoring of directional components of electric and magnetic fields as well as total electric and total magnetic field. 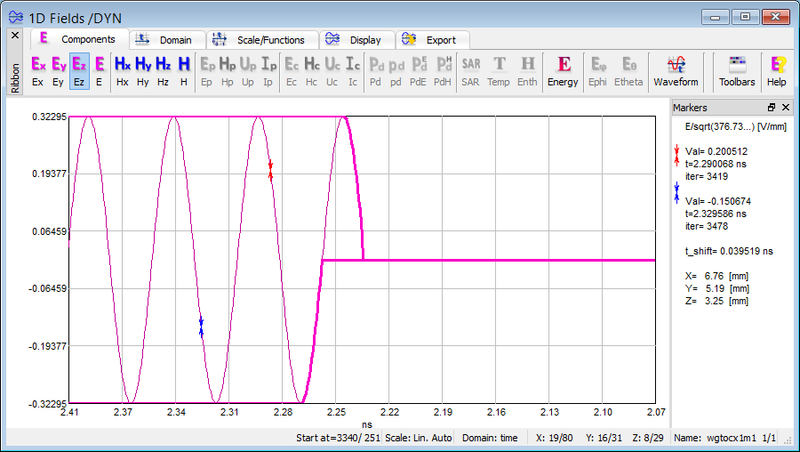 QuickWave delivers 1D distribution display, which allows time domain monitoring of the electric field (directional components Ex, Ey, Ez, and total E-field) and magnetic field (directional components Hx, Hy, Hz, and total H-field) along any line parallel to one of coordinate axes or in a particular point of the circuit versus time. The 1D monitoring delivers instantaneous and envelope (time-maximum) values of the chosen quantity and is available in 1D Fields window. 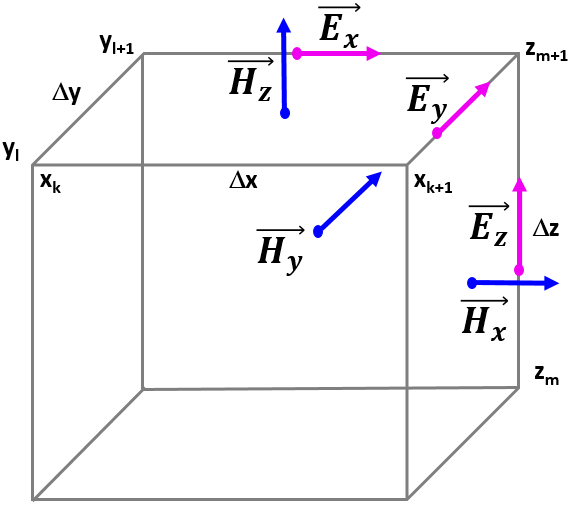 The time-dependent 2D distribution of the electric field (directional components Ex, Ey, Ez, and total E-field) and magnetic field (directional components Hx, Hy, Hz, and total H-field), is available for every FDTD layer along each of three axes. 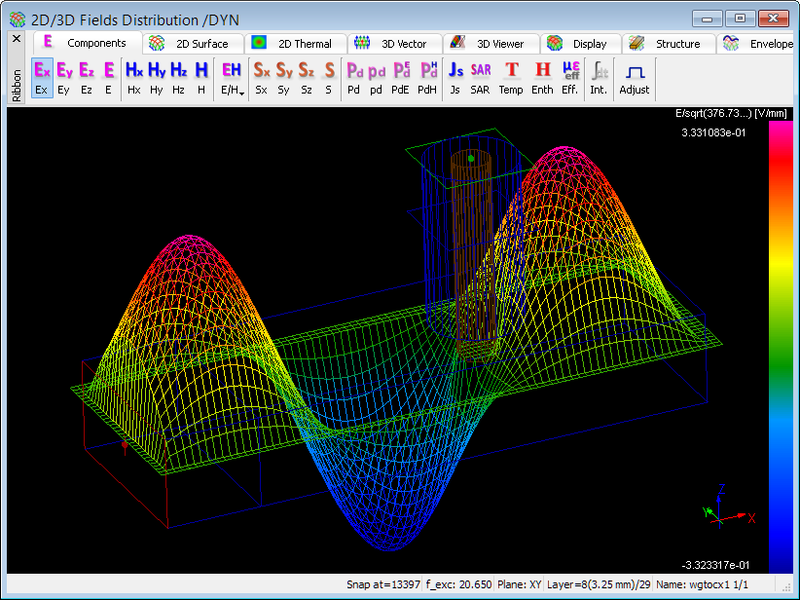 The 2D electric and magnetic field distributions are available in 2D/3D Fields Distribution window, which enables time domain monitoring and displaying of the amplitude (instantaneous, time-maximum, time-average) of total electric and total magnetic fields as well as their directional components (Ex, Ey, Ez, Hx, Hy, Hz). 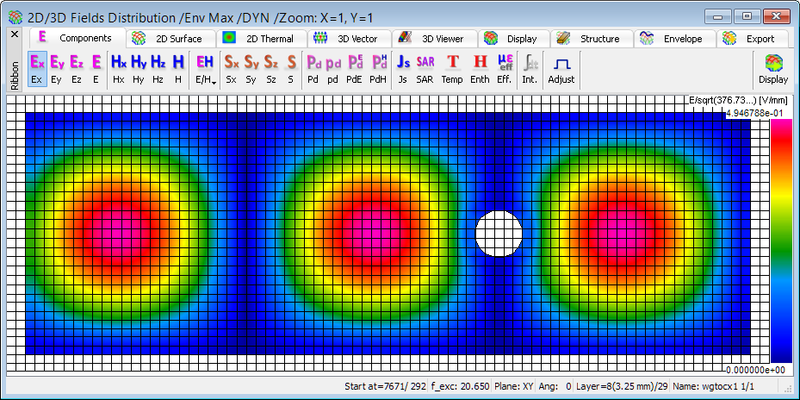 QuickWave offers also the Viewer 3D display of time-dependent electric and magnetic fields (Ex, Ey, Ez, Hx, Hy, Hz, total E, total H) distribution. 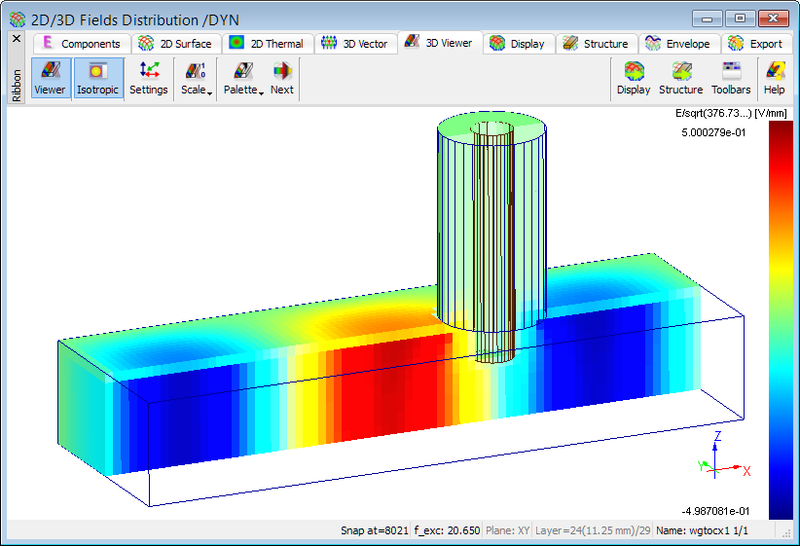 This feature is enabled in 2D/3D Fields Distribution window and allows for displaying the instantaneous, time-maximum, and time-average of electric and magnetic fields.